“The new face of Scottish fiddling in the USA,” Katie McNally has made waves in both the American traditional music scene and abroad since the release of her debut album, “Flourish,” in 2013. 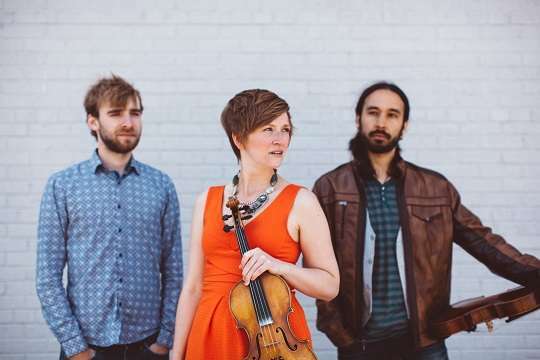 Based in Boston, her latest project synthesizes her elegant and powerful fiddle playing with the talents of genre-crossing pianist Neil Pearlman and bluegrass phenom Shauncey Ali on viola. The trio’s album “The Boston States” reinvigorates and reimagines the historic musical connection between Maritime Canada and New England. McNally has curated a collection of tunes that draws inspiration from mid-century recordings of Cape Breton fiddlers both in Nova Scotia and Massachusetts and adapts the creative energy of the modern Boston acoustic music scene. Recorded in Cape Breton, the album was hailed as “one of the best modern Cape Breton records of the past ten years.” Listen to some tunes here.